Basement Systems Edmonton: The "Go To" Professionals For Your Below-Grade Construction Needs! 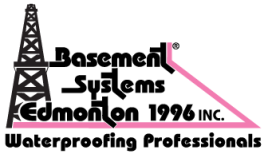 Basement Systems Edmonton is the premiere basement waterproofing and foundation repair company serving the Central and Northern Alberta areas. We bring to you, the licensed and professionally trained experts, certified installers and courteous sales staff to solve any basement problems throughout Alberta including Edmonton, Camrose, and Lloydminster. When your basement floods or your crawlspace has a moisture problem, there are a number of problems that could occur. Mould and mildew cause health concerns by contaminating the air that you breathe. Rot brings on structural damage that effects the integrity of your home and causes floors to sag and walls to bow. If left unchecked, basement wall cracking can lead to the crumbling and caving-in of the foundation of your house. And an unfinished, damp basement or crawlspace is a large, unused portion of your home; a factor which could decrease it's total value. Basement Systems Edmonton has the expert knowledge and professionally trained core of technicians to give you the peace of mind you want. With our FREE written estimates, we can inspect any below-grade situation that may be present and hand to you an itemized list of the most cost effective solutions. Our team of professionals has the knowledge of over 30 years experience; 16 of those years in keeping the basements of Edmonton and surrounding areas, dry, safe and livable. As part of the Basement Systems Inc., international network, we have access to the finest resources in the industry including more than 30 patented products. Being locally owned with global expertise and connections gives us the edge when it comes to your specific, basement, structural or crawlspace concerns. Contact Basement Systems Edmonton today for your FREE below-grade estimate!